The band formed in 1919 as a flute combination by Alderman Isaac Baxter and Mr. Samuel Gracey. 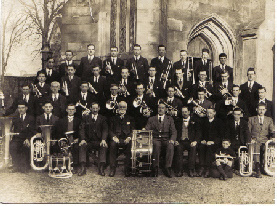 The band was know as the 1st Old Boys and changed to brass in 1923. A few years later the band was renamed to Newtownards Silver Band. Throughout the years quite a number of Aldermen and Councillors have acted as President or Vice-President of the band including J. M. Poots , Stanley Woods, J. D. Beckett, J. Algie, N. Francis. The McDonald family have a long association with the band. Bill McDonald was a founder member, Norman McDonald was solo cornet and then conductor for many years. His son, Trevor McDonald also played the cornet and has been a senior music instructor with the RAF for many years. Andy McDonald played the trombone and was Chairman, Roy McDonald, played the euphonium and was Secretary for about 40 years. John McDonald played the euphonium and Fiona played the baritone, tenor horn, cornet, flugel horn and soprano cornet at various times. Newtownards Silver Band plays regularly during the summer months in the North Down area and over the years has been honoured to play on special occasions such as the opening of the Queen's Hall and the Newtownards Leisure Centre. In recent years the band has played throughout Ireland playing at the St. Patricks day parade in Sligo 2004, many Belfast parks, the Belfast Lord Mayor's Show and also in Ballymoney at the Joey Dunlop Memorial Centre. The Band also appeared in a television programme featuring the famous Northern Ireland boxer Wayne McCullough.